FINALLY! I know, you guys have been waiting so patiently. Thank you! It took me a little time to get familiar with my Instant Pot. And yes, I do love it. However, I still can’t and won’t give up my slow cooker. To me they have two very different uses. And yes, I realize I can use the slow cooker function on my Instant Pot, but my slow cooker is large and I just still love it. I can’t give it up just yet. I have two favorite features on the Instant Pot. 1. I love that you can sauté directly in the pot. 2. I love how quickly I can have “slow cooked” food. This soup in particular allows me to sauté the ingredients for a few minutes to help create lots of flavor. Then literally 10 minutes later I’ve got dinner that tastes like it’s been cooking away all day long. I’m obsessed with the combination of split peas and red lentils. It creates a thick and protein packed soup that I end up eating all week long. I love love love it, and I’m so excited to finally be sharing it with you! But don’t worry, if you don’t have an Instant Pot yet, I’ve got slow cooker directions as well! 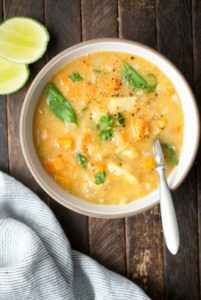 A quick and easy hearty soup that can be made in the Instant Pot or the Slow Cooker! Turn on the sauté function on the Instant Pot. Add the olive oil, onion, carrots, potatoes, salt, garlic powder, paprika and cumin and cook for 3-5 minutes until veggies begin to soften. Add the garlic and cook for another minute. Turn off the sauté function and add the red lentils, split peas and stock and stir to combine. Close the lid and turn the valve to sealing. Cook on manual/high pressure for 15 minutes. Either let natural release, or quick release. Remove the lid and stir in the spinach, parsley and lime juice. Serve warm! Soup will thicken as it cools. Add the olive oil, onion, carrots, potatoes, salt, garlic powder, paprika, cumin, garlic, lentils, split peas and stock to the slow cooker. Cook on low for 7-8 hours or on high for 4-5 hours. When done cooking, remove the lid and stir in the spinach, parsley and lime juice. Serve warm! I don’t have an Insta pot — does it come out as well in a crockpot?? Without sautéing the veggies first? Looks great, I’ll try it in my IP next week.